Probably quite a few Scottish middle or long distance runners have never raced in Aberdeen. Yet since the 1960s many good athletes have lived and trained in the area. 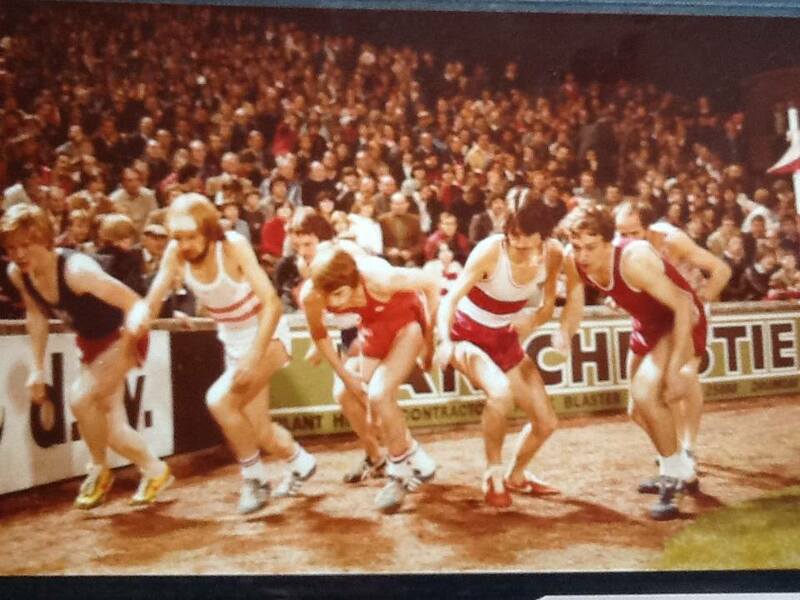 Aberdeen AAC and Metro Aberdeen RC have done well in team contests – particularly road racing events like the late-lamented Edinburgh to Glasgow Road Relay (AAAC won three times in the 1980s). A number of international runners (for example cross-country men and women) have improved their fitness in the Granite City. Before and after WW2, Aberdeen FC’s Pittodrie Stadium used to host an annual Sports Day – my father James Youngson ran the mile there in 1934. Occasional races thereafter featured as half-time entertainment. The photo below shows how narrow the space was between touchline and crowd; and how much shoving was necessary at the start! The Aberdeen Marathon (which usually included the annual Home Countries International match) and Half Marathon used the spectacular Beach Promenade as part of their courses. Nowadays, the Aberdeen Baker Hughes 10k is the big event, with a huge turn-out from runners of widely-varying ability. 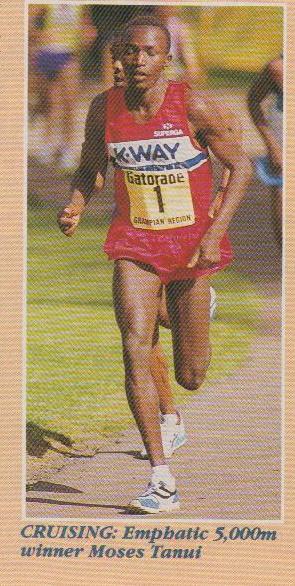 In 1982 the Aberdeen Marathon record was set by England’s Gerry Helme, who recorded a rapid 2.15.16. Local woman Lynda Bain did 2.41.41 in 1984. Both athletes went on to represent Great Britain. The fastest times in the Half Marathon were in 1984, when Denis Fowles of Wales ran 64.41 and Lynda Bain 73.22. These were all performances on the verge of world-class; and race-day atmosphere at these events was second to none, with in-depth media coverage. 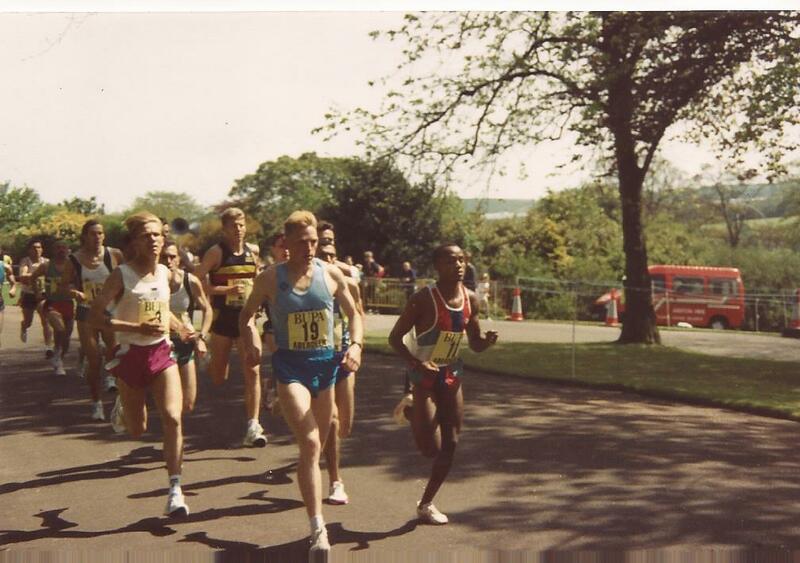 For a few years from 1992, Aberdeen’s splendid Duthie Park hosted an International Festival of Running. For example, during the first promotion, winners included Britain’s Olympic silver medallist Peter Elliott, who won the road mile; and World 10,000m champion Moses Tanui, from Kenya. The latter’s effortless yet powerful style was the most impressive running I have ever seen in Aberdeen. Later versions of this event included a memorable battle between (World Indoor 3000m champion) Yvonne Murray and her Scottish rival (World 10,000m victor) Liz McColgan; and a Union Street Mile featuring amongst others (former World Cross-Country winner) Zola Budd-Pieterse. Autographs collected included those of many major international champions: Peter Elliott, Zola Pieterse, Steve Cram, Steve Ovett, Brendan Foster, John Treacy, Khalid Skah, Eamonn Martin, Kirsty Wade, Rob Denmark, Moses Tanui, Sonia O’Sullivan, Liz McColgan, Yvonne Murray and many more. Not surprisingly, these fixtures were marvellous treats for enthusiastic fans. But what about other less glamorous races in Aberdeen venues? The North-East Cross-Country league, which flourished from the 1960s to 1970s, and featured clubs from Aberdeen, Dundee and St Andrews, used two different courses in Aberdeen. One was at Hazlehead Park, through tree-lined paths and past golf courses. The only problem that the route involved a pony track and, occasionally, runners collided with horses! The alternative course was devised by Aberdeen University Hare and Hounds Club. This started on cobbles, went onto tarmac, down dangerous steps, over a metal bridge, along a dusty path, up a steep grassy bank, onto playing fields, down a long tarred road, right over a dangerous main road, onto sand dunes, then harder sand right beside the sea, across the main road again, along a rough undulating path and finished up a very steep little hill! Six and a quarter miles of very varied terrain. John Myatt and Bill Ewing (both Scottish international athletes) were the two fastest men on this course. In recent decades, most of the main Aberdeen cross-country races have taken place at Balgownie, which offers flat grass near rugby and football pitches, plus a major climb each lap. Hydrasun used to sponsor races for all ages there; and the Scottish Masters and East District championships were held successfully at the venue. Runners will certainly enjoy training and racing in Aberdeen!